Anyone who's raised ducklings knows what a magical treat it is. The time flies by so fast, and before you know it they are all grown up. I'm documenting the first month of their lives, and will provide updates every month or so after that. Even after their feathers are in, things get interesting in the "teen" years as they approach sexual maturity. 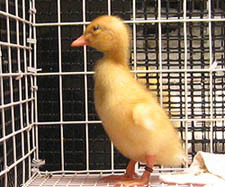 There's alot of great information on these pages for the new duckling owner. 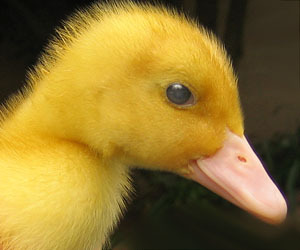 If you are an experienced duck person you'll enjoy the pictures. They might even jar a few fond memories of your own duckling days. 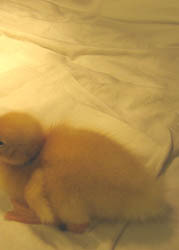 See our duckling's progress day by day and learn how we adjust their care, feeding and shelter as they grow up. Have fun! What an exciting day, the ducklings arrived safely! They were very thirsty and hungry. 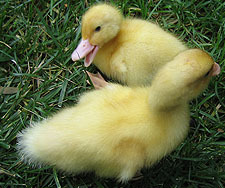 I dipped my finger into some fresh water and let them nibble on that first, then showed them how to dunk their beaks. Once they had a drink, I took some starter food and saturated it with water to make a soupy consistency and put that next to the food. They figured out right away what that was all about and enjoyed their first meal. Grooming is harder than it looks! They took their first steps, wobbly at first, then in a few minutes they started figure out how to groom. It's comical watching them try to stand and groom. They finally decided sitting was easier. All this tuckered them out, so it was nap time. In between napping, they ate and drank, and had their first poops. On the first day, until their food has gone through their tiny systems, the poop was greenish and runny. In no time it firmed up and looked alot like what went in the beak end. 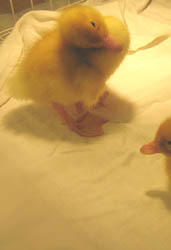 They started to jump high enough to reach the brooder light, which is a 60 watt light bulb. Greg and I reinforced the cage sides and door so they couldn't get their heads through and hurt themselves. The cage floor is 1/4" vinyl covered wire mesh, with fleece and soft towels covering the entire bottom. I put the lid of a tupperware shoebox under their food and water bowls to help keep their bed area dry. We made sure to handle them alot and give them tons of "face time". 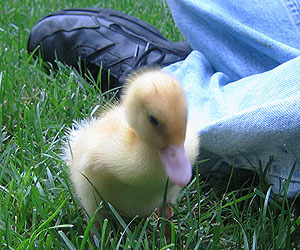 Ducklings will usually bond closest to the first faces they see. We have a Pekin drake and hen (boy and girl) and the leg bands helped us tell them apart. The boy has the purple band and the girl the brown one. The girl has what looks like a small gap between her beak and eye we're keeping a close watch on. 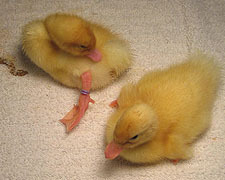 The ducklings have much better coordination already and are grooming on their feet. One will watch what the other one is doing and copy all the moves. They are eating ravenously and drinking their water, so it's time to move up to a bigger ceramic container. While some people will not give their ducks anything but bottled water, I am using plain tap water, since they need to be used to it by the time they are in the pond. That's a ways off. They are still in their cage inside the house. Time to put something around the sides of the cage by their food since they are getting good at flinging it. I put a square beveled egde mirror on one end, under the brooder light, and they snuggle up to it. 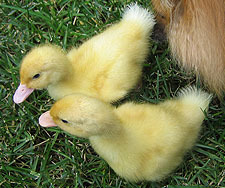 That also makes it easier to get one duck out at a time without the other feeling as lonely. They still don't like it when Greg holds one and I put one back in the cage to take pictures. 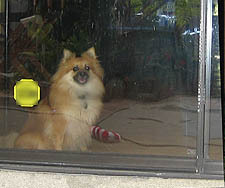 The girl is in the cage and not happy - look, she left me a present! The wing flapping is adorable. It's funny how they already know how to do that before they have feathers to flap. They are very fuzzy and looking cleaner today. The gap on the girl's beak area is gone. All filled in with fluff, what a relief! 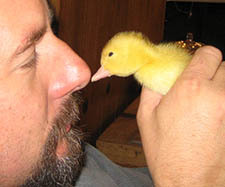 The girl is really squirmy, so guess which duck Greg grabs first? You guessed it. I finally got her to calm down and held her for awhile. 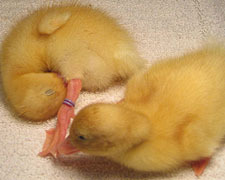 Both ducks fell asleep in our hands. Already they know us and chirp softly and run up to us when they see us. They also have Greg trained. They squeak loudly when they are out of food and he comes running. 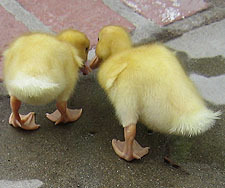 I was kidding around and said "You ducks are nothing but Trouble!" and the boy duck cocked his little head sideways and looked at me as if to say "Yeah, Mom, that's me!". Each day they grow a little bigger and the way they look is changing. Their beaks are still blunt and dark pink. They are grooming alot more and napping pretty much in between eating and drinking. As soon as they hear us in the morning they start chirping for food. It's time for their leg bands come off. It would have been alot easier to do yesterday because they are almost tight now so it'll be harder to cut off safely. 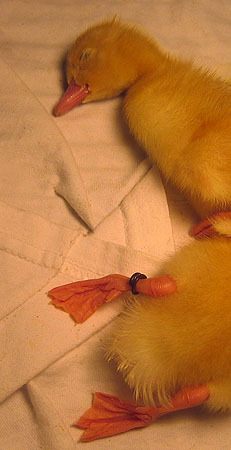 I wrap the duckling firmly in a small towel, exposing only the banded leg. Greg makes two cuts to the band with a pair of wire cutters. 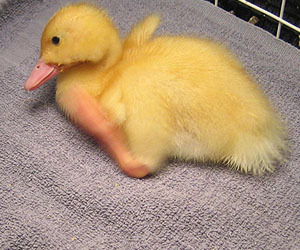 He's very careful not to hurt the duckling or cut the leg. The same process for the second duck, only this time, we put a small mark on the leg with a permanent marker so we can tell them apart until we get to know which is which by sight. They are growing so fast that their appearance changes literally overnight. You can already see that they have grown alot more overnight. 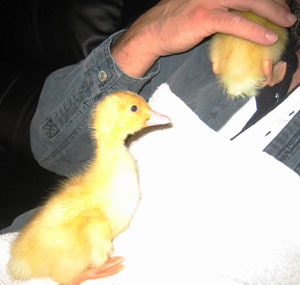 Greg holds both ducks while I snap the picture. He has started using a towel because the poops are growing too! They are really eating alot and growing so fast. I'm still mixing the food with water. It keeps their cage cleaner, if you can call it clean! We clean the towels twice a day now, and the food and water is changed several times a day as needed. I rinse them each time because they like to walk in the food and accidentally poop in it sometimes. They are still indoors with us because the nights are chilly and I don't want the little leapers to be injured on a hotter bulb. I'd have to put a higher wattage bulb in, they are at 60w right now. They aren't jumping as much now, I think they realize that this is their home and we're the keepers of the food. They chatter alot when I come near the cage. Today is my son Cameron's 22nd Birthday, so he was over for awhile and held the ducks. We're introducing them to all of our family and friends so they become socialized and learn to recognize different people. The first weekend with the ducklings. Greg has to be gone all day and I have to be home for the construction crew, so I get to be home with the duckies all day! I won't leave them for long because they are so active now and into anything they can get to. Already they have downy little tail feathers. Their beaks are beginning to become less round and more orange in color. 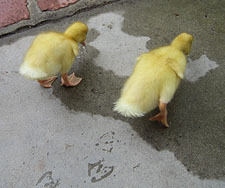 Today is a special day for the ducklings, they had their first outdoor excursion. Greg brought both ducklings outside while I ran to grab my camera. 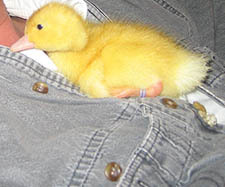 The minute he sat down on the lawn, the boy duck jumped up on his lap and snuggled in. The girl was trying to get underneath me while I was squatting down to take the picture. What's going on under there? The ducks folowed me for awhile, then they followed Killer. 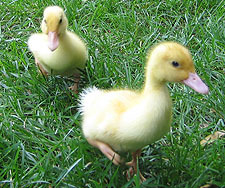 They discovered grass, leaves and puddles, pecking at everything in sight. I made sure there was nothing like screws, nails or staples they could accidentally ingest and be poisoned. Ooooooh!!! Our very first puddle! What does it do? We're not ready to go back in, give us another few minutes of playtime pleeeeeese! Killer was interested in everything the ducks were doing. One of them pecked at her rear and Killer snapped, but didn't bite. That was enough to lock her inside so the ducks could have a few minutes on their own. 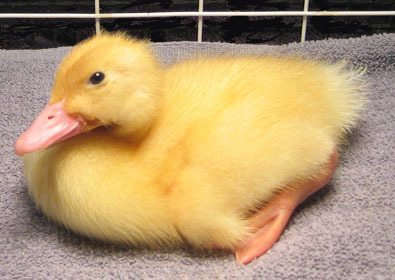 Greg was jokingly calling the boy duck "Trouble" all week. He really responds to the name, so we officially named him "Double Trouble" today. 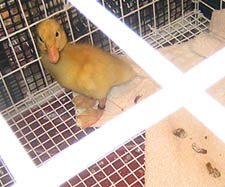 When introducing existing pets, even ones who have been around ducks before, they can react badly to being pecked in the wrong spot. We played it safe and the ducks had a great time outside with us. 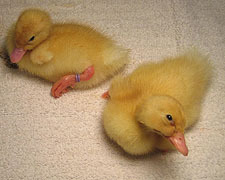 Well, it's day 7, and time to wrap up our first week with the new ducklings. They are already more than twice the size they were when we got them. They are eating like little piggies. They let me know loudly when their food is getting low. It's been a ton of fun. These ducks are so well behaved and are already bonded closely with Greg and I. We can't wait to see what they do next week!